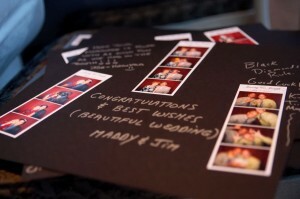 The Photo Booth craze has returned and it’s stronger than ever! All those silly poses, goofy faces and catching that kiss for a lifetime are just of few of the memories created with a photo booth at YOUR next event. 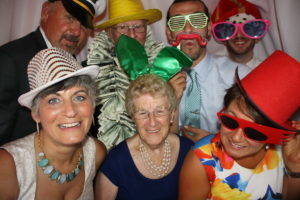 From Weddings to Corporate Parties, Sweet 16 to Retirement Parties, a photo booth works for any kind of event. Let’s face it, not everybody is a dancer so this offers an additional form of entertainment for your guests. 1. How many people can fit in your booth? Both of our booths are what is called a ‘soft-sided’ photo booth. That means three sides are curtains, allowing many people access to the booth for the pictures (as you can see from the photo on the left). The more people that are in the booth for the photo, the louder the laughter becomes. 2. We have seen a lot of photo booths that look like a circus tent. What does your booth look like? Our booths have a sleek and elegant look with a footprint which is 6 feet long, 3 feet wide and 6.6 feet tall, so it doesn’t take up a lot of space. Also, after extensive testing with different color curtains, we now only use white curtains. The reason is that the white curtains really bring the colors to life you your photos. 3. Does it come with a scrapbook? Yes it does. Any event that has a guest of honor, such as a wedding, anniversary party, bar/bat mitzvah, sweet 16, quinceañera or retirement party, a scrapbook is INCLUDED in our fee. One photo from each session goes into the scrapbook and your people in the photo are then asked to write a few words for a fun memory. At the end of the event, you take the book home. No need to wait for it to be delivered. Royalty free copies of all photos for free! When shopping for your booth, here are a few things you should know before you book with anyone. 1. Know the difference between a photo ‘station’ and a photo ‘booth’. A photo station is just what it sounds like. It is a camera mounted on a tripod taking pictures of the subject standing in front of a backdrop. Sometimes there is someone to assist you. Photo stations usually don’t provide printed photos at the event but you can get them on-line. 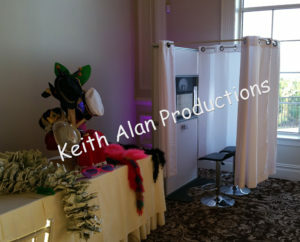 A ‘photo booth‘ is the traditional, enclosed booth (either soft-sided or hardshell) that allows the guests privacy in the booth. Also, the photos are available within seconds after completing your photo session. 2. Find out what is included in booking the booth. There are a lot of companies that lure you in with a low price to rent the booth and then, start upselling you on the individual items that you need. Sometimes, they can start at $399 and by the time you have everything you want, you’re over $1,000! Always ask for what’s included in the price. 3. Sales Tax on photo booths. 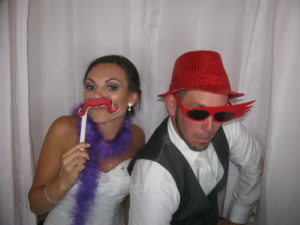 The State of Connecticut REQUIRES BY LAW that all photo booth rentals are subject to sales tax. If a company is not charging you sales tax or says that they don’t have to, they are in violation of the law. Look for someone else to do business with.